A tactical radio network is a radio network in which a transmitter broadcasts the same information to its receivers. In this paper, dynamic spectrum management is studied for multiple cognitive tactical radio networks coexisting in the same area. First, we consider the problem of common rate maximization subject to a total power constraint for a single tactical radio network having multiple receivers and using parallel subchannels (parallel multicast channels). Mathematical derivations show that the optimal power allocation can be found in closed form under multiple hypothesis testing. An outer loop can be used to minimize the power subject to a common rate constraint. Then, we extend the iterative water-filling algorithm to the coexistence of multiple cognitive tactical radio networks without requiring any cooperation between the different networks. The power allocation is performed autonomously at the transmit side assuming knowledge of the noise variances and channel variations of the network. Simulation results show that the proposed algorithm is very robust in satisfying these constraints while minimizing the overall power in various scenarios. Tactical radio networks are networks in which information (voice and packet based data) is conveyed from one transmitter to multiple receivers. When several coalition nations coexist in the same area, current technologies do not permit reconfigurability, interoperability, nor coexistence of the radio terminals. Software defined radio has been developed for reconfigurability of the terminals with software upgrades and for portability of the waveforms. Cognitive radio has been introduced by Mitola in 1999 as an extension to software-defined radio . Cognitive radio has been developed for spectrum availability recognition, reconfigurability, interoperability, and coexistence between terminals by means of software defined radio technology, intelligence, awareness, and learning [1, 2]. The fundamental principles of cognitive radio are on one hand to identify other radios in the environment that might use the same spectral resources by means of spectrum sensing and on the other hand to design a transmission strategy that minimizes interference to and from these radios by means of dynamic spectrum management. The major goals of cognitive radio are to provide a high utilization of the radio spectrum and reliable communications whenever and wherever needed . Applications of cognitive radio include, but are not limited to, tactical radio networks, emergency networks, and wireless local area networks with high throughput and range. The broadcast channel has been introduced by Cover in 1972 as a communication channel in which there are one transmitter and two or more receivers . The broadcast channel in which independent messages are sent to the receivers (unicast channel) belongs to the class of degraded channels in which one user's signal is a degraded version of the other signals. Its capacity region is fully characterized and can be achieved by superposition coding [3, 4]. Contrary to a single unicast channel, the sum of unicast channels as well as MIMO broadcast channels is nondegraded [5, 6]. Previous studies on parallel broadcast channels have focused on scenarios in which independent messages are sent to the receivers (parallel unicast channels) [7–10]. The optimal power allocation can be achieved by a multilevel water-filling over the parallel channels, which is an extension of Gallager's 1968 water-filling strategy for single-user parallel Gaussian channels . Some other studies have considered parallel broadcast channels in which simultaneous common and independent messages are sent to the receivers [5, 12, 13], or simultaneous common and confidential messages are sent to the receivers . Contrary to a unicast channel, a tactical radio network can be thought as a multicast channel with only common information. The capacity of a single multicast channel is limited by the capacity of the worst receiver [4, 15]. However, less work has been done on parallel multicast channels . In the first part of the paper (Section 2), we extend the water-filling strategy  to multiple receivers considering parallel multicast channels with perfect channel state information (CSI) at the transmit side. In this case, the extended water-filling strategy maximizes the common rate subject to a power constraint (inner loop) or minimizes the power subject to a common rate constraint (outer loop). Mathematical derivations show that the optimal power allocation can be found in closed form under multiple hypothesis testing [14, 17, 18]. Distributed multiuser power control has been studied for parallel interference channels, leading to a common strategy known as iterative water-filling [19–21]. Distributed algorithms, although suboptimal, are preferred to centralized algorithms in practical scenarios because of their scalability. 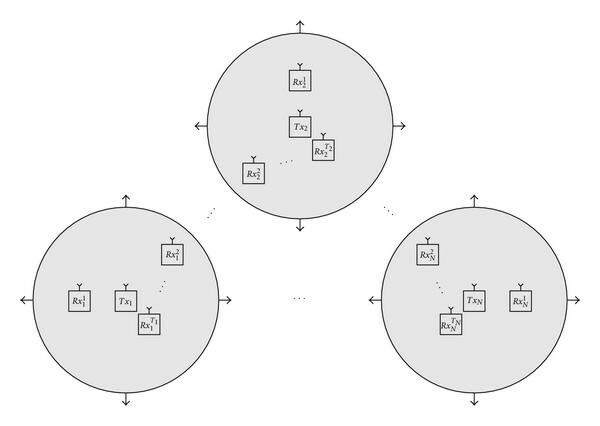 In the iterative water-filling algorithm, each network considers the interference of all other networks as noise and iteratively performs a water-filling strategy. At each iteration, the power spectrum of each network modifies the interference caused to all other networks. This process is performed iteratively until the power spectra of all networks converge. In the second part of the paper (Section 3), capitalizing on the previous results, we introduce an autonomous dynamic spectrum management algorithm based on iterative waterfilling  for multiple cognitive tactical radio networks coexisting in a given area and willing to broadcast a common information (voice, data, etc.) to their group. The problem can be modeled as networks, each network with a single transmitter willing to send a common message to its corresponding receivers over parallel scalar Gaussian subchannels. It is assumed that each transmitter has the knowledge of the channel variations and noise variances in its own network and iteratively updates its power spectrum until a common rate constraint for all receivers is satisfied. Although this paper focuses on multiple cognitive radio networks for tactical communications, the proposed algorithm can be applied to any application requiring spectrum management between multiple cognitive radio networks for parallel multicast channels with only common information. In Section 4, simulation results are given for multiple scenarios and compare the proposed algorithm with the worst subchannel strategy. Finally, Section 5 concludes this paper. with the variance of the input signal on channel , the power allocation among all subchannels, the total power constraint, and the SNR gap which measures the loss with respect to theoretically optimum performance . To achieve the maximum common information rate, the common message codebook cannot be broken into different codebooks for each channel, that is, joint encoding and joint decoding must be performed across all subchannels . This transmission scheme is referred to as "single codebook, variable power" transmission . -receiver parallel Gaussian broadcast channel. If , then the optimal power allocation is and finish. If then the optimal power allocation is and finish. Search over all to find that satisfies , then the optimal power allocation is and finish. The optimal power allocation corresponds to Gallager's water-filling strategy for single-user parallel Gaussian channels . In this formula, the optimal power allocation takes into account the difference between the water-fill functions and the weights of the different receivers. Figure 2 shows the power control for a single tactical radio network. 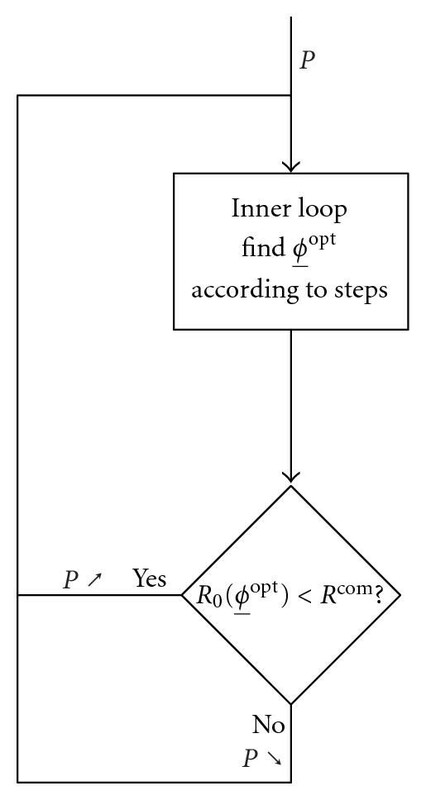 An inner loop determines the power allocation maximizing the common rate subject to a total power constraint. Then, an outer loop minimizes the power such that a common rate constraint is achieved. Algorithm 1 provides the proposed power allocation for power minimization subject to a common rate constraint. The inner loop and the outer loop correspond to lines 13–21 and 6–30, respectively. 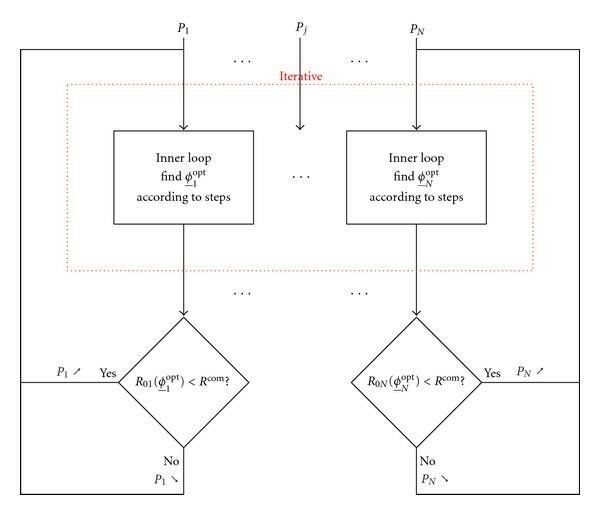 Note that if all the steps in the multiple hypothesis testing are needed, the complexity of the algorithm increases exponentially with the number of receivers . Algorithm 1: Minimization of the power subject to a common rate constraint. Power control for a single tactical radio network. Multiple cognitive radio networks for tactical communications. Considering jointly the maximization of the aggregate common rate subject to a total power constraint per network in a centralized algorithm is an extensive task, since it would require the knowledge of the channel variations of all the interference terms for all , , , . This knowledge can be acquired through a feedback channel from the receivers to the transmitter of each network assuming that the acquisition time is much lower than the coherence time of the channel fading. To this end, each terminal must be equipped with a spectrum sensing function to estimate the noise variances and a channel estimation function to estimate its channel variations. This information can be further transmitted to a centralized unit. Moreover, even if a centralized cognitive manager was able to collect all the channel state information (CSI) within and between the different networks, solving (22) would require an exhaustive search over all possible 's or a more efficient genetic algorithm. Therefore, after collecting the noise variances and the channel variations of its network, each transmitter has to apply Algorithm 1 autonomously and to update its power allocation regularly to reach an equilibrium between the different networks. 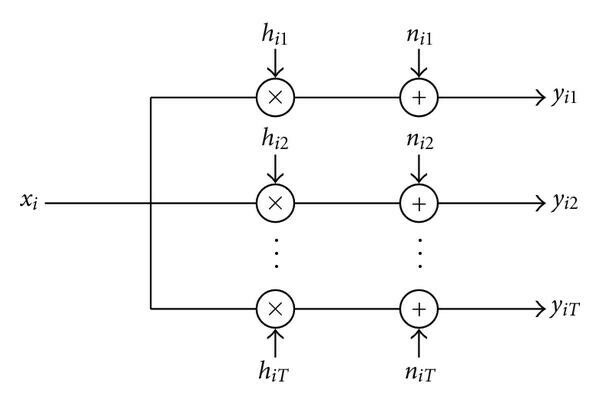 As shown on Figure 4, within each network, an inner loop determines the power allocation maximizing the common rate subject to a total power constraint. This process is updated regularly between all the different networks until they reach a Nash equilibrium. Finally, an outer loop minimizes the power such that a common rate constraint is achieved for each network. The algorithm for the coexistence of multiple tactical radio networks is presented in Algorithm 2. Algorithm 2: Distributed power allocation for minimization of the power subject to a common rate constraint. Distributed power control for multiple tactical radio networks. which gives a noise variance per subchannel of approximately . Simulation results for a single tactical radio network are performed using Monte Carlo trials for the locations of the transmitters and the receivers with receivers and subchannels and 2 particular scenarios. The maximum available power at the transmitter is W. In the first scenario (left part of Figure 5), the first receiver sees a small noise on the first three subchannels and a very strong noise on the 4th subchannel, while the second receiver sees a very strong noise on the 1st subchannel and a small noise on the last three subchannels. In the second scenario (right part of Figure 5), we take an extreme situation in which the first receiver sees a very strong noise on the 3rd and 4th subchannels and the second receiver sees a very strong noise on the 1st and 2nd subchannels. The different noises seen by the different receivers can be thought as subchannel variations depending on the location, a subchannel occupied by a primary transmitter, a jammer, or different channel characteristics. Water-fill functions for two scenarios over four subchannels. Figure 6 shows the results of the power minimization subject to a common rate constraint ranging from kbps to kbps over 103 Monte Carlo trials for both scenarios. Algorithm 1 provides the minimum power for all scenarios compared to the worst subchannel strategy as this is the optimal strategy. Moreover, for the scenario 2, the worst subchannel strategy uses the maximum power for all common rate constraints. Results on the power minimization subject to a common rate constraint for both scenarios. 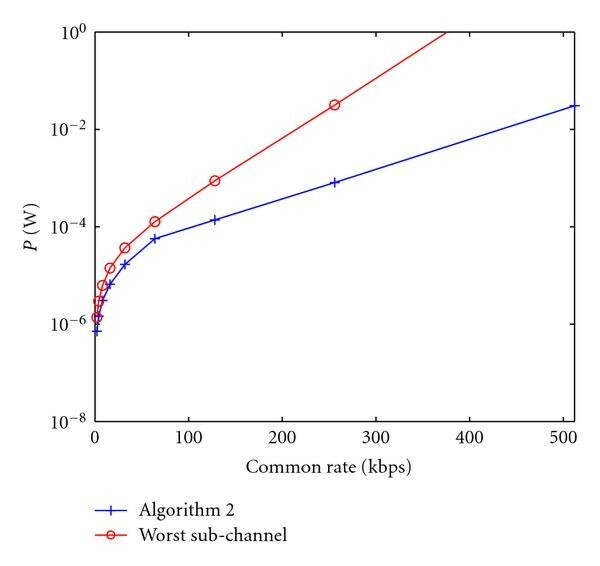 In the second set of simulations, we compare Algorithm 2 with the worst subchannel strategy for the minimization of the power subject to a common rate constraint with networks whose transmitters and receivers are in a same square area of 1 km2. To highlight the robustness of our algorithm, we take an extreme scenario in which the receivers see a different noise on their subchannels (as shown in Figure 7). In the first network, a very strong noise ( ) is seen on the 4th subchannel by the first receiver and the 1st subchannel by the second receiver. In the second network, a very strong noise ( ) is seen on the 3th subchannel by the first receiver and the 2nd subchannel by the second receiver. Figure 8 shows the results of the power minimization subject to a common rate constraint ranging from kbps to kbps over 103 Monte Carlo trials. The results are averaged for both networks. In this scenario, it can be seen that Algorithm 2 outperforms the worst subchannel strategy. 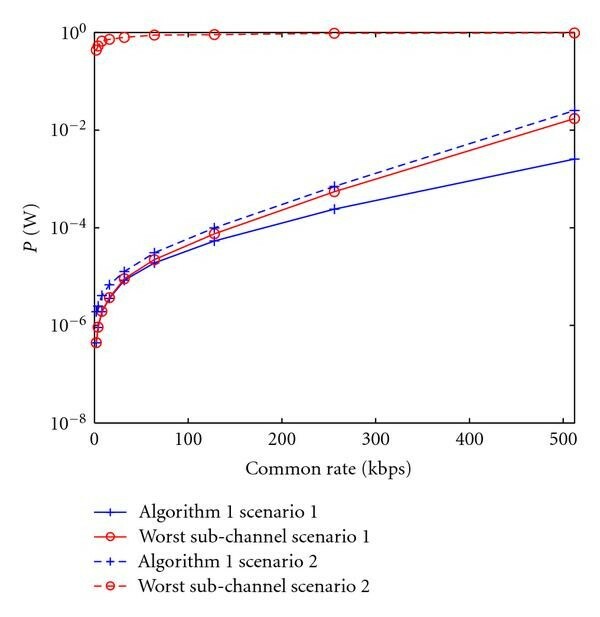 Therefore, in practical scenarios in which the interference temperature varies along the subchannel and the receiver locations, Algorithm 2 provides a novel distributed strategy to find the power allocation minimizing the power subject to a common rate constraint. Since it is based on closed-form expressions, the algorithm has reasonable complexity for a low number of receivers. However, the search for the best set of weights requires an exhaustive search over all possible weights. Therefore, to reduce the complexity in a practical algorithm, the weights are taken from a given data set in interval . Water-fill functions for two networks over four subchannels. Results on the power minimization subject to a common rate constraint averaged for two networks. In this paper, dynamic spectrum management was studied for multiple cognitive tactical radio networks coexisting in the same area. First, we have considered the problem of power minimization subject to a common rate constraint for a single tactical radio network with multiple receivers over parallel channels (parallel multicast channels). Then, we have extended the iterative water-filling algorithm to multiple receivers for the coexistence of multiple cognitive tactical radio networks assuming knowledge of the noise variances and channel variations of the network. Simulation results have shown that the proposed algorithm is very robust in satisfying these constraints while minimizing the overall power in various scenarios. This work was carried out in the frame of the Belgian Defense Scientific Research and Technology Study C4/19 funded by the Ministry of Defense (MoD). The scientific responsibility is assumed by its authors.